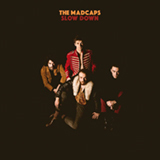 Beast Records - THE MADCAPS "Slow Down"
Hailing from Rennes, the mother city of French garage rock, The Madcaps play smart Rnb and wild Rock n Roll with catchy melodies and timeless grooves. After 3 years touring around Europe with 150 shows under the belt, The Madcaps are now a stage war machine. They’ll be on tour over Europe in 2017 to promote their brand new album Slow Down. To fans of the Kinks, Beatles, Ray Charles or Daptone productions, you would be sorely wrong to abstain.